Use the Time and Sales window to track, record, and save time and sales information for products traded through X_TRADER. Open the Time and Sales window from the Control Panel by selecting the icon. You can populate a Time and Sales window with one or more products using the drag-and-drop method from the Market Grid. Time and Sales does not track the inside market. Time and Sales uses the price feed to show and record sales information. Because some markets do not include every trade in their real time price feeds, this information can be incomplete. For additional information, please refer to exchange specific documentation. 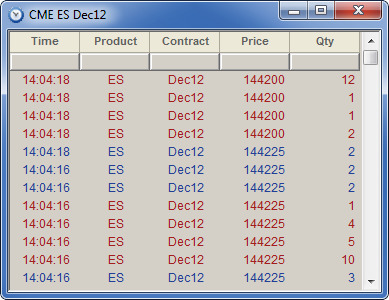 You can drag-and drop a spread product into the Time and Sales window to display and time stamp their market activity. However, only the generic spread names based on the products and expirations appear. Customized names of spreads do not appear.